The children engage in activities that develop eye-hand coordination and manual dexterity, and that support hand dominance. This meaningful, practical work is integral and essential to the early childhood day and includes such things as baking (kneading bread), sewing, sweeping, chopping vegetables, polishing wooden toys and shelves, cleaning, and dishwashing. Boys and girls participate equally in these activities, thus building inner strength and self-esteem as they become accomplished in purposeful work. The teacher encourages healthy, creative play by providing the essential ingredients: silks, cloths, play stands, stones, logs, shells, simple dolls, capes, wooden figures, puppets, and the like. 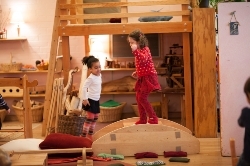 Boards to build houses, stands for puppet plays, and balancing boards for obstacle courses are all incorporated into the rich spectrum of movement through creative play. 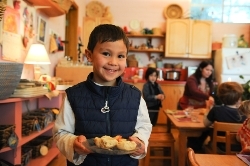 Boys and girls alike have tea parties in the play kitchen or build spaceships from wooden planks, chairs and play cloths. 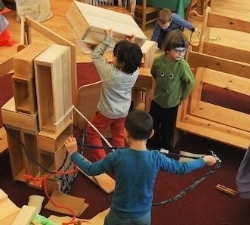 Creative free play allows the children time for self-directed exploration and discovery, and a myriad of opportunities each day to help them develop their sense of competence, industry and self-esteem, as well as social skills that will form an important basis for their grade-school success. Through the building up, transforming, and rearranging of the indoor environment, the children innovate, interact, and grow stronger and more adept physically, emotionally and cognitively. While play serves the important psycho-social function of "transforming" reality into something in which the child may play an important, competent and powerful role, the trials, errors, and revisions of free play are in many ways a most sophisticated curriculum in science, humanities and math! This direct sensory-motor interaction with the things and people in the environment is not only the ideal way to best nourish what Rudolf Steiner called the child's "will energies," but it lays an essential foundation for later reading and math: the symbols of letters and numbers will have a depth of meaning for the child who has been given the chance to experience the concrete realities of what these symbols represent. As Dr. David Elkind wisely points out, "The language of things must precede the language of words, or else the words don't mean anything." In other words, the rich and extensive play experiences in nursery and kindergarten serve as an important foundation for later academics!